The kit with mesh is designed for applications under tile, stone and nailed hardwood floors. TempZone Flex Roll allow for radiant heating at an affordable cost. Install radiant heating in front of your kitchen appliances and bath fixtures for a warm path of under floor heat where you stand the most. Come with the programmable nSpire Touch which features a 3.5 full colour touchscreen and a modern design that instantly augments any rooms style. With an integrated Install Wizard, its never been easier to set up a radiant heating system according to your preferences and schedule. The nSpire Touch allows you maximum control over the floor temperature with 4 programmable events for each day of the week, which is great for Goldilocks households where there will be frequent adjustments to the temperature or thermostats schedule until its just right. Dual voltage thermostat with sensor included. This innovative and practical electronic programmable thermostat is specifically designed for use with an electrical in floor heating system. Can be used on 120 or 240 volt circuits. Equipped with an integrated GFCI, this unit also includes a floor probe for in floor temperature readings. The Master Programmable Thermostat (sold separately) and Dual Voltage Power Module are required to manage larger WarmlyYours electric radiant floor heating systems that exceed 15 amps. Use for 120V installations utilizing more than 120 square feet or 240V installations using more than 240 square feet of WarmlyYours floor heating. Each Master Programmable Thermostat requires a minimum of one Power Module and may require additional Power Modules depending on the size of your floor heating system. Master Thermostat controls up to 10 linked Power Modules on different line voltages. Each Power Module provides an additional 15 Amps of service. Like floor heating itself, the programmable nHance thermostat represents a harmonious blend of style and usability. Its modern design incorporates a large, backlit display that makes it easy to read in low light areas. This dual voltage (120V/240V) control, with built-in self-testing GFCI, comes with pre-programmed settings for ultra-fast installs. With its intuitive user-interface, you can easily set the nHance up for your exact needs and specifications. If you have a consistent schedule, this programmable thermostat will deliver a maximum level of comfort when you need it most, like during your morning routine, while still keeping your overall energy use to a minimum. Includes floor sensor. Some floor heating jobs are just too large for a single radiant heating thermostat to handle alone. The nJoin power module is here to help you heat those larger projects. The refined and modern-looking nJoin links up to any WarmlyYours thermostat in the nSpiration series (nSpire Touch WiFi, nSpire Touch, nHance, or nTrust) to increase the electrical output in 15 amp increments to allow for heating additional areas or large rooms, like basements, with a single thermostat. 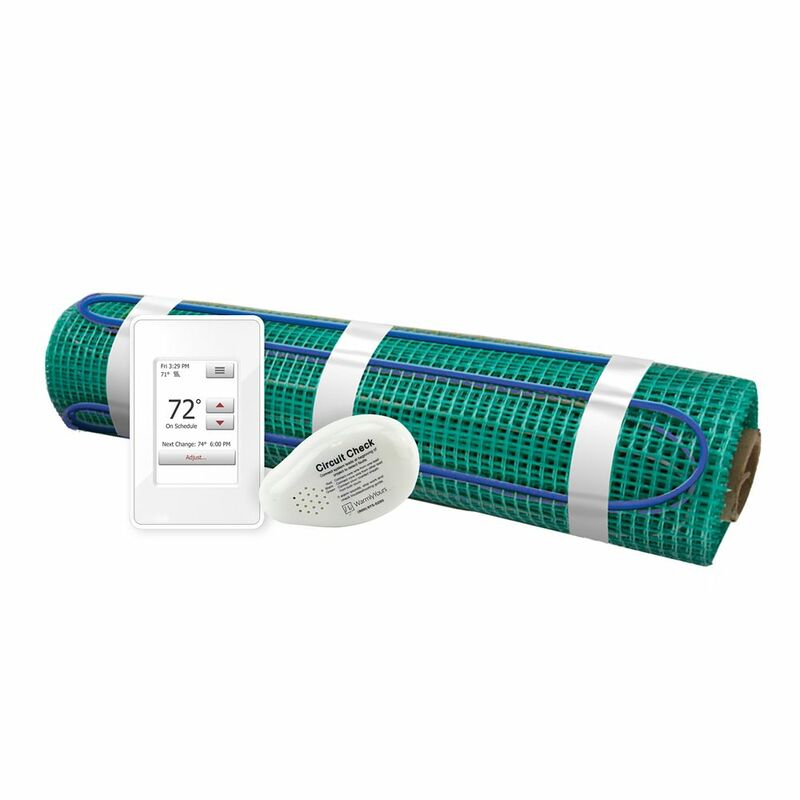 Floor Heating Kit 240V-Tempzone Flex Roll 3.0 Feet x 52 Feet + Touch Screen Thermostat The kit with mesh is designed for applications under tile, stone and nailed hardwood floors. TempZone Flex Roll allow for radiant heating at an affordable cost. Install radiant heating in front of your kitchen appliances and bath fixtures for a warm path of under floor heat where you stand the most. Come with the programmable nSpire Touch which features a 3.5 full colour touchscreen and a modern design that instantly augments any rooms style. With an integrated Install Wizard, its never been easier to set up a radiant heating system according to your preferences and schedule. The nSpire Touch allows you maximum control over the floor temperature with 4 programmable events for each day of the week, which is great for Goldilocks households where there will be frequent adjustments to the temperature or thermostats schedule until its just right. Dual voltage thermostat with sensor included.